Born to pious parents in 1457 in Soncino, Italy, her father became a Dominican tertiary while Stephana was very young. She was taught the catechism by the stigmatic Blessed Matthew Carrieri who lived at the nearby Dominican convent. Even though she was too small to understand, he told her that she was to be his spiritual heiress. She began receiving visions of Dominican saints from age seven, at which point she made vows of poverty, chastity and obedience. Carrieri died when Stephana was 14, and soon after he appeared to her in a vision and she received the stigmata. She became a Dominican tertiary at Soncino at age 15, and was devoted to caring for the poor and sick. She founded a community of Third Order sisters in Soncino, and served as its first abbess. 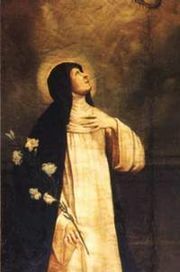 Her counsel was sought by many, including Saint Angela Merici, Blessed Augustine of Biella, and Blessed Osanna of Mantua. Although she had no formal theological training, she could discuss mystical theology at the most profound level. She could read the hearts and minds of the people around her, and had the gift of prophesy and healing. She lived in a nearly continuous fast, and inflicted severe penances on herself. Stephana accurately predicted the date of her own death. She died of natural causes on 2 January 1530, and was beatified 14 December 1740 by Pope Benedict XIV.